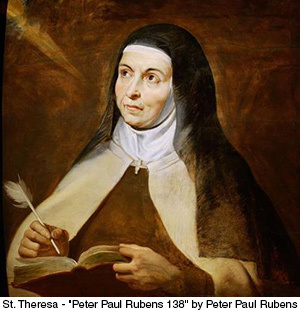 Born Theresa de Ahumada in 1515 in Avila, Spain, Carmelite nun St. Theresa of Avila was known for her spiritual experiences. These led her to adopt a lifelong imitation of the life and suffering of Jesus. They also motivated her to reform her Carmelite order. The beautifully preserved walled city of Avila is closely associated with the saint. In fact, Theresa was educated in the Augustinian Convent and later entered the Carmelite Convent of the Incarnation in Avila. Theresa found the rules at the Augustinian Convent quite lax because there were many visitors and parties. She made lots of friends, though, and she found it easy to slide back into a worldly life. However, she began learning and practicing mental prayer and teaching others. Some years after entering the convent, she fell ill with malaria and never fully regained her health. Thus, for a while she used her illness as an excuse or distraction from prayer. Although she returned to prayer she still found it difficult, but God gave her spiritual delights. St. Theresa began having visions including one of “the sorely wounded Christ” and mystical experiences where God’s presence would overwhelm her senses. After many setbacks, in 1562, St. Theresa finally got permission to establish a reformed Discalced Carmelite convent. This new order was based on absolute poverty because she wanted to correct what she saw as the laxity she found at the Convent of the Incarnation and other cloisters. In her new convent, St. Joseph’s, she began spending a lot of time writing. One of her books was about her spiritual life and the Way of Perfection. Further, she continued to establish reform convents throughout Spain. Alba de Tormes near Salamanca was one of them. In fact, she died there in 1582. After her death, an autopsy revealed that St. Theresa bore five stigmata wounds on her heart. Any one of these wounds should have killed her instantly. Her heart and other relics are preserved in a reliquary above the altar in the church of the Carmelite Convent of the Anunciación. She was beatified on April 24, 1614 by Pope Paul V and in 1622, Pope Gregory XV canonized her. Medieval Avila, surrounded by a magnificent city wall, is a magnificent sight. It has an historic, fortress-like cathedral and several Romanesque churches. In addition, there are two shrines to St. Theresa. The Convent of St. Theresa stands on the site of her birth and there is also the Monastery of the Incarnation where she lived. NAWAS pilgrims may visit her tomb in Alba de Tormes, located in the ornate church of the Carmelite convent of the Anunciación. St. Theresa founded this convent in 1570. In 2015 Catholics around the world honored St. Theresa of Avila, in celebration of the 500th anniversary of her birth. Numerous events took place, including special Masses and liturgies, conferences and retreats. NAWAS offers two pilgrimages including visits to Avila and Alba de Tormes, plus the Marian shrines of Fatima and Lourdes. In addition, we can custom design any program you’d like to promote. Start in Lisbon … pray at the Shrines of Our Lady in Fatima and Lourdes … tour the famed pilgrimage center of Santiago de Compostela … visit Avila, birthplace of St. Therese … see Madrid, Spain’s impressive capital. Immerse yourself in the spiritual wonders of Fatima and Lourdes … admire the 12th century cathedral in Salamanca … visit Alba de Tormes and the walled city of Avila, where St. Theresa was born … plus art-filled Madrid and Barcelona.